Recently, I attended the Randonneurs Ontario annual banquet and prize presentation. It was a great evening where we were able to get together with some old friends. There are a good number of trophies that are presented each year but the premier award goes to the year’s “Most Outstanding Rider” who is presented with the J.B. Wadley Memorial Trophy. Few of the current members know who J.B. Wadley was and what his association is with Randonneurs Ontario. Few people have had such an influence on my life in cycling as Jock Wadley. My first recollection of his name was when I bought a copy of the first edition of his wonderful magazine Coureur in 1955. The Coureur was like a breath of fresh air. The only other English language cycling magazine available at that time was the weekly Cycling which was essential reading for anyone interested in the sport but tended to concentrate only on the British scene and to give very little coverage of racing on the Continent. The first edition of Coureur, Winter 1955. I picked up my first copy of Coureur from Fred Dean’s bike shop in Wandsworth. Jock had just been there to drop off copies of his first edition. It was definitely his mag. He had written almost everything in it. He had published it himself (remember this was long before ‘self-publishing’ on computers) and then delivered it by bike to all the bike shops that he could reach. In those days there were hundreds of bike shops in London. It was forty pages devoted almost entirely to the Continental scene but with a photo spread on the 1955 Tour of Britain. There was absolutely no advertising in this premier edition. I devoured every word in that magazine with its stories of Coppi, Anquetil the GP des Nations and many other articles of racing on the other side of the Channel. At two shillings and six pence Coureur was five times the price of a copy of Cycling but for me it was well worth it. 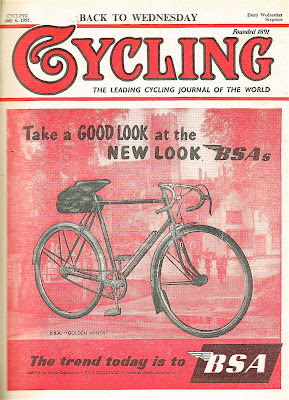 A 1956 copy of Cycling. Jock had started Coureur when another weekly magazine, The Bicycle, went out of business earlier in 1955. He had written for The Bicycle since 1936 and had been their foreign correspondent. Unlike Cycling, The Bicycle covered the continental as well as the British scene and Jock spent a lot of time in France where he became fluent in French. Following the demise of The Bicycle, Jock was offered a job with Cycling but turned it down as he didn’t feel that he would fit in with the editor’s very conservative views. 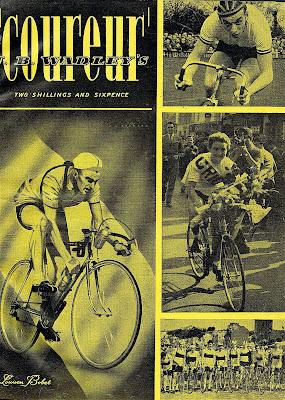 Coureur was originally a quarterly but it was so successful that by the spring of 1957 it became monthly with a change of name to Sporting Cyclist. It now had a full time staff and was published by the Charles Buchan organization with Jock as editor. I didn’t meet Jock until 1967 when I managed to get a press pass to the finish of the Tour de France at the Parc des Princes velodrome in Paris. I was going to London the following day and Jock asked if I would drop off some films at the Sporting Cyclist office in Fleet Street. Of course I was happy to oblige. The film had shots that Jock had taken throughout the Tour including many shots of Tom Simpson before his tragic death on Mont Ventoux. Following that initial meeting, whenever I returned to London I would meet up with Jock for lunch or dinner or a bike ride in the Surrey lanes. He was such an interesting person to be with. He was full of stories of the cycling scene and seemed to be on personal terms with most of the World’s great riders. In 1971 Jock came to Canada to cover the Tour de la Nouvelle France, a week long pro bike race in Quebec. Unfortunately he wasn’t covering the race for his own magazine, which was now International Cycle Sport. Due to some very unfortunate business transaction he was no longer involved with that magazine. He was now reporting for London’s Daily Telegraph. After following the race in Quebec, Canadian cycling official and ex-Brit., Ken Smith persuaded him that he should see some more exciting racing in Canada before returning home. A Six Day race was due to take place in Delhi, Ontario the following week. Ken drove him from Quebec and they stayed with Clare and me in Toronto for a few days before going on to Delhi. We arrived at the Delhi Hockey Arena to the sound of the pack of riders rumbling around the boards of the 118 metre steeply banked track. Jock was in heaven. He was so excited by everything that he saw; the super fast and competent bike handling, the excited and knowledgeable crowd and the wonderful track built by Delhi resident Albert Schelstraete. 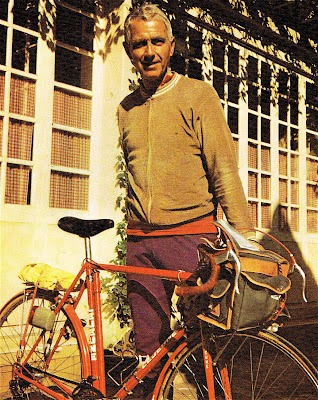 Jock had seen all the best bike racing in the World from the Tour de France to the Vel d’Hiv, from World Championships to Olympic games but he said that he had never seen more exciting bike racing than he saw that night at Delhi. 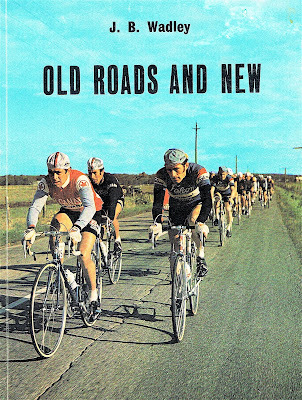 The story of the Tour de la Nouvelle France and the track at Delhi formed the basis of a book he then wrote, “Old Roads and New”. 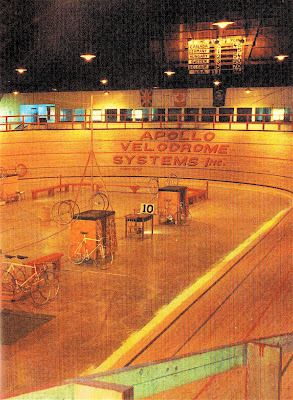 This book was also self-published and it included an account of Jock’s ride in the 1971 Paris-Brest-Paris. This article, entitled Brestward Ho! has since been attributed to the rise in popularity of long distance cycling in the English-speaking World. However it wasn’t this article that got me into long distance cycling but another that Jock wrote where he mentions a ride across the length of the Pyrenees from Atlantic to Mediterranean: the 720 km Raid Pyrenean. Since my first visit to the Pyrenees in 1957, that marvelous country has always fascinated me. My business partner, Mike Brown and I were looking for a challenge and Jock’s article came to mind. A call to Jock put us in touch with the Raid organizer and we arranged to ride it in September 1981. On the route profile that we had the Portet d’Aspet didn’t seem too much of a problem compared to the other major climbs but when we got there it certainly was the toughest climb of them all. As I climbed it in the dark, in a raging wind and rainstorm I remembered Jock’s words and imagined him looking down on us and saying, “I told you so”. After Mike and I finished the Raid we were looking for another long distance challenge and Jock’s account of Paris–Brest-Paris came to mind. However to ride P-B-P one has to qualify in sanctioned events and there were none close to Toronto. Mike and I decided to form the Toronto Randonneurs and organize the qualifying rides. This we did and now, thirty four years later the club is still very active although renamed Randonneurs Ontario. The J. B. Wadley trophy that is presented every year to the Club’s “most outstanding rider’ is the trophy presented to Jock when he finished P-B-P back in 1971. Jock’s widow, Mary gave it to me, along with many of his other cycling mementos, soon after his death. The trophy’s plinth has grown over the years to accommodate all the plaques with the recipient’s names engraved. I’m sure Jock would be very proud. This year’s recipient of the trophy is Bob Mcleod. Bob does most of the administrative work for the club, organizes brevets, rode a good number of brevets in 2017, including the 1000 km, and he is an all-around good guy — someone any organization would be proud to have as a member. Jock would have been impressed. Read about the origins of the Ontario Randonneurs.